Amazing weather and lots of interesting things to look at! 4 Years ago or so, my mother and I went to this market(it is there every year). --> And found the most wonderfull seller, making beautiful bags. We both bought one - of course. Which brings me to the pictures above. Ever since we bought those bags we have been looking for them everywhere. So when I went to that market, and found the same seller - how could I not buy a bag?! 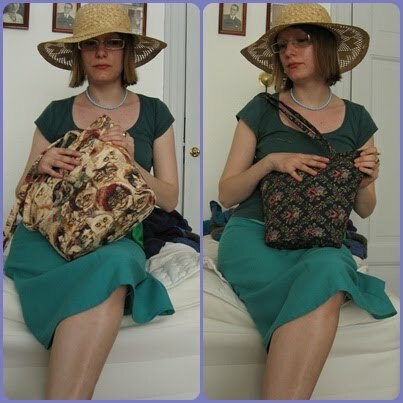 On the pictures I am modeling the bags - notice my straw hat - I love it! The bag on the left is the one I bought for my mother, and the bag on the right is the one I bought for myself. Pretty pictures! :), I really adore the bags. I had no idea there was a market in Frederiksberg garden. AWESOME.